Today is tank day! I’ve just decided. And now I probably won’t find any other tank games to post about. Oh well. I’ll confess that THQ’s ongoing money-woes have me fearing for the security of some much-anticipated videogames (and the good folk who make ’em), most especially Metro: Last Light and Company of Heroes 2. Hopefully Relic and 4A are ring-fenced from the cuts’n’terror at the besieged publisher, and the release of some new pictures of the former’s Eastern Front battle still my palpitations somewhat. Click for gigantification of these, naturally. I suppose it’s not quite as high-tech-looking as I’d been hoping – I can clearly see Dawn of War 2 and CoH1 driving this. The fire’s suitably firey, mind, and by all accounts COH2 is going to offer a grander scale of battle than the macro lens of Dawn of War 2. Those tanks sure are fighting at close quarters, but perhaps that’s just for the sake of fitting ACTION into one promotional screen. For much more on COH2, you’ll be wanting to read Adam’s excellent haul of information and developer chat. 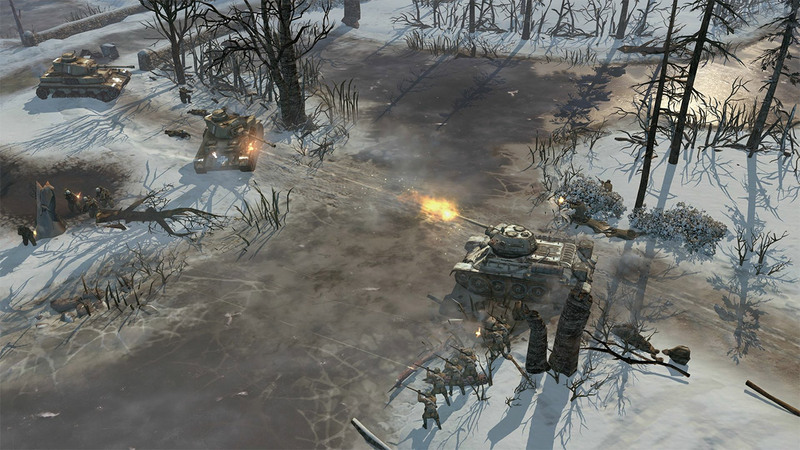 Tagged with Relic Entertainment, THQ, Company Of Heroes 2.